Do you want to know how much CO2 emission you save the climate from, when you give your things away or find used items at Freemi? Then here is your answer. Our new version of the app shows you how much CO2 you can avoid when you give your belongings new life at Freemi. Read more below. When you circulate your belongings, you make a positive difference for the environment. You can put it like this: Every time you give one of your belongings away on Freemi, you extend its life cycle and you fulfil another person’s need for this particular product. By freely sharing existing man-made resources you reduce the need for producing more of the same and you also reduce the CO2 emission that would have harmed the environment if the product was thrown in the trash. At Freemi we want to put more focus on this circular free economy and how we can reuse and recycle our existing resources. If more people circulate their used belongings, we can use the full potential of our resources and save the environment from massive amounts of CO2. But how muchCO2 do you really save the environment from, when you circulate a couch, a desktop or a pair of shoes at Freemi? We have the answer right here. 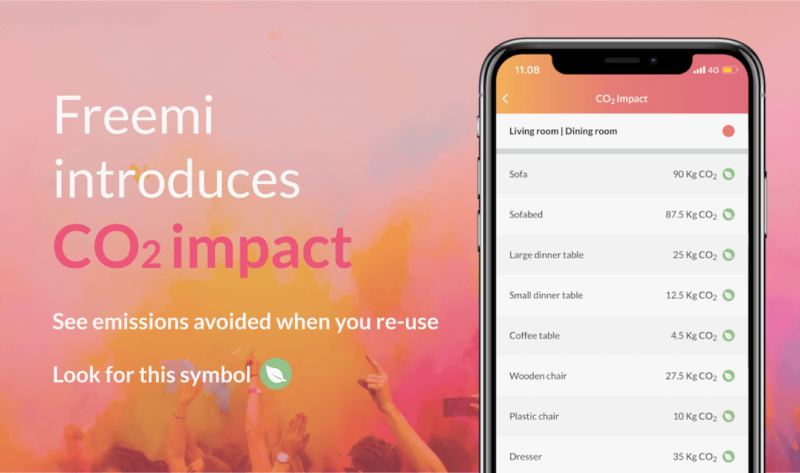 A new feature at Freemi makes it possible for you to identify how much CO2 emission you can save the climate from, when you circulate items at Freemi. When you create a free item at Freemi, you can now choose which category that fits your item. At the right side of the screen, you can see how much CO2 you avoid per item that you circulate. When you find an item that you would like to have, you can tab on the item to get in line. Now you can see how much CO2 emission is avoided by giving that particular item a new life. The CO2 emission measured in kilos (Kg) for the various items on Freemi, are inspired by the Spanish environmental organisation Aeress. The numbers are based on the average CO2 emission that is avoided from the product life cycles of the specific items. The numbers are meant to paint an instructional and general picture of how much CO2 that approximately can be avoided every time a given item is recycled. It is our hope, that more consumers will realize how much of a difference they can make for the climate by thinking circularly, even when they recycle small things like a pair of shoes. In the UK, 22 million small items of furniture are disposed every year. In the capital of Denmark alone, 20.000 tons of bulky waste is thrown out every year, and 70% of this is send to incineration. In contrast, Freemi’s freeconomy successfully recirculates 4 out of 5 items proving that things can not be labelled ‘trash’ before given the chance of a new life at a new home. 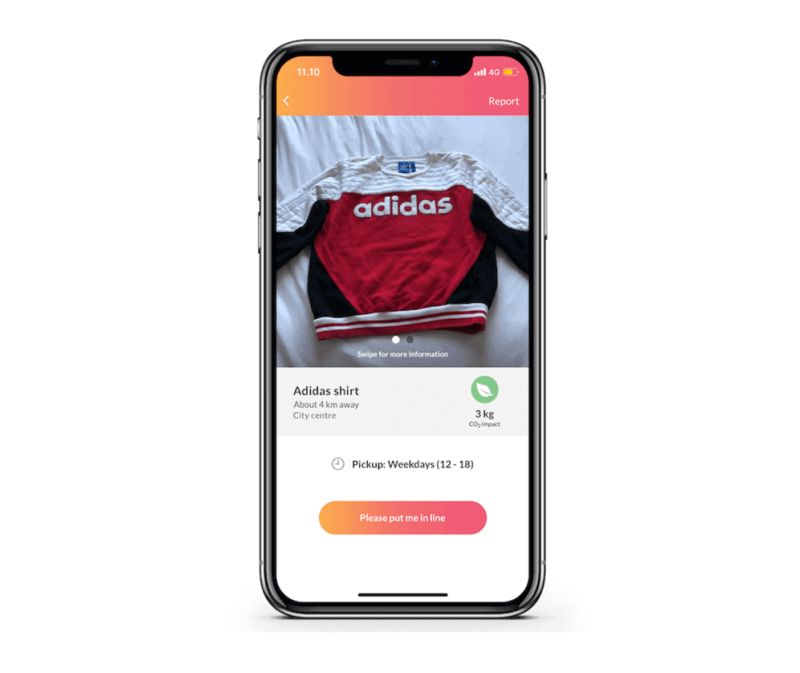 When you find items at Freemi nearby you, or when you give away your used belongings for free, you participate in an ecosystem which circulates and saves valuable resources every day. We hope that this new illustration of the positive effects of recycling will get more people to use the circular economy of Freemi.